Today, for this years’s 3rd Mother’s Support Day we went to pick grapes. Since the farm was a little far away, the children played games with teachers and learned about grapes during the bus ride there. Once we arrived at the farm, they could pick and eat any grapes they wanted. There were many varieties to choose from! 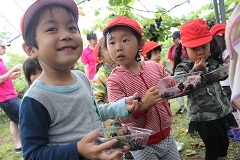 The children seemed so happy and enjoyed being outside and picking grapes. 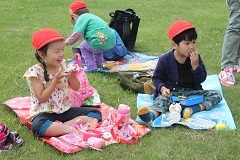 After that, we went to a nearby park for lunch. The children may have eaten many grapes but still had room for yummy lunch boxes prepared by their parents. 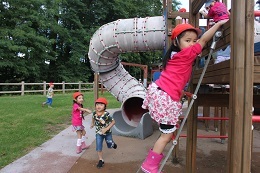 After playing some at the park, we came back to the kindergarten and concluded an excellent Mother’s Support Day. It was a great day full of fun and everyone was full of delicious grapes!